Schools in England should teach "core British values" alongside cultural diversity, a report says. A review of how schools teach citizenship found there was not enough emphasis on UK identity and history. The report, by Sir Keith Ajegbo, says pupils should study free speech, the rule of law, mutual tolerance and respect for equal rights. 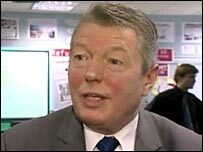 Education Secretary Alan Johnson has said schools should "play a leading role in creating community cohesion". He commissioned the review in the wake of the London bombings. Ministers see schools as a key place to promote understanding between communities and to combat intolerance and religious extremism. Welcoming the report, Mr Johnson announced it would become compulsory for secondary school pupils up to the age of 16 to learn about shared values and life in the UK in their citizenship lessons. He said youngsters should be encouraged to think critically about issues of race, ethnicity and religion with "an explicit link" to current political debates, the news and a sense of British values. Understanding the make up of the UK and the recent history of Britain was crucial, he said. "More can be done to strengthen the curriculum so that pupils are taught more explicitly about why British values of tolerance and respect prevail in society and how our national, regional, religious and ethnic identities have developed over time," he said. "I believe that schools can and should play a leading role in creating greater community cohesion. The values our children learn at school will shape the kind of country Britain becomes." Sir Keith Ajegbo, a former head teacher of a London school and Home Office adviser, was asked to look at how "citizenship" and "diversity" was being taught in schools. Citizenship became compulsory in England's secondary schools in 2002. His report says more could be done to ensure children "explore, discuss and debate their identities within their citizenship lessons". Sir Keith said: "Britain is committed to the values of free speech, the rule of law, mutual tolerance and respect for equal rights. They are things that are fundamental to our society." He suggested that schools should be prepared to tackle controversial topics in the news such as the debate over immigration, and the UK's place in the European Union as well as the legacy of the British Empire. He said: "It is the duty of all schools to address issues of 'how we live together' and 'dealing with difference', however difficult or controversial they may seem". Where could pupils bring those difficult questions if not to school, he asked. Sir Keith's report also says more needs to be done to engage white, working-class pupils with the issue of diversity. It says white pupils can feel disenfranchised as much as pupils from other ethnic backgrounds. "Many indigenous white pupils have negative perceptions of their own identity," it says. The new element for citizenship lessons will be called "Identity and Diversity: Living together in the UK" . British history will be essential to it, said Sir Keith. At the moment, history is optional after the age of 14. The three existing planks of citizenship lessons are social and moral responsibility, community involvement and political literacy. Schools can give distinct lessons on the subject or introduce elements of it in various lessons. The report said it was best taught as a separate subject. How dare they try to teach Britishness in only English schools! Sir Keith said citizenship lessons had been introduced as a response to political apathy but it was now time to broaden their remit. Last year schools inspectors Ofsted said the subject was taught badly in one in four schools in England. Nick Johnson, from the Commission for Racial Equality welcomed the report: "Certain values may be universal, but their application through our history is unique to these islands," he said. "Britishness does not need to be dominant and certainly not a domineering identity, but it must be a significant common facet that we all can share. "As such it is a key component in developing greater ties that can bind society together." Shadow education secretary David Willetts said: "Grounding citizenship on the teaching of British history is crucial. "We believe citizenship shouldn't just be taught in the abstract but linked very closely to narrative British history." Teachers' representatives at the NASUWT said they shared the government's aim of promoting equality and diversity. But they also warned that it might be difficult to add the new themes to an already-crowded curriculum. Alison Johnston, from the Professional Association of Teachers, said: "It would not be appropriate to promote an imperial British myth by teaching that values such as democracy, justice and fair play are exclusively British or implying that Britain is superior to other countries." Do you think that schools should teach 'Britishness'?